8 Foot CPAP Tubing is compatible with CPAP, Bipap and Bilevel systems. Features a smooth interior and corrugated exterior that provides for flexibility without kinking. The Acapella Vibratory PEP Mouthpiece combines the benefits of both PEP therapy and airway vibrations to mobilize pulmonary secretions and can be used in virtually any spatial orientation. The Aeromist Plus Nebulizer Compressor is easy to pick up and transport as they are compact, feature break resistant handles, and has a low center of gravity. Includes disposable nebulizer kit and 5 washable replacement filters. Aloha Nasal Pillow CPAP Mask includes small, medium and large nasal pillows that can be interchanged or replaced. Super lightweight, with ball & swivel joint providing ultimate mobility. Comfortable and easy to remove and put on head gear. BOOST Oxygen is 95% pure Oxygen, where as the purity of oxygen in the air is only 21%. Available in 2 lightweight, portable sizes for easy to use and convenient travel. Ideal for altitude sickness, faster aerobic recovery, loss of breath, hangover recovery, and for athletes. Sleep better and more comfortable while using your CPAP machine with the Contour CPAP Pillow 2.0. Designed to improve air flow, prevent dry eyes, mouth and nose and reduce mask air leaks while sleeping. SleepNet CPAP AIRgel Full Facemask a lightweight design with an ergonomic cushion and active headgear connector that promotes moving with a reliable seal. Easy to put on and remove quickly. Available in three different sizes, and offers replaceable airgel cushions. The AIRgel Nasal CPAP Mask by Sleepnet features a 360 degree rotating connector allowing for maximal mobility while sleeping, proving superior comfort while maintaining a soft, tight and comfortable seal with the AIRgel cushioned mask. Available in sizes small, medium and large. Mask sizes can be interchanged or replaced easily. CPAP Mask Cleansing Wipes are soft, safe and effective made with solvent free formula and Aloe Vera. Can be used for daily cleaning of CPAP masks to remove dirt, grease, oils and other natural residue. 64 wipes per pack. 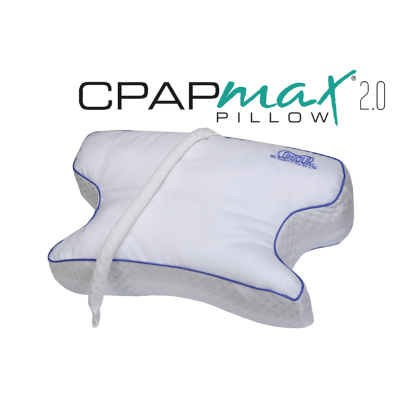 The CPAP MAX Bed Pillow 2.0 is designed with height adjustable memory foam layers, pressure free side cut-outs, and an enhance hose control for your CPAP mask. Helps stop mask leaks, noise and pressure. Crush Resistant Oxygen Tubing is compatible with high or low flow applications and helps prevent kinking with is relaxed, crush resistant, low-memory material. 25 feet long, Violet. The E-Z Wrap Ear Protectors are soft, closed-cell foam tube cushions that slide over the head or face tube of an oxygen cannula. Green Oxygen Tubing cannot be crushed, providing security of uninterrupted oxygen flow. Remains straight when unrolled, decreasing pull on cannula allowing for greater comfort. The Holding Chamber is designed to enhance the delivery of the Meter Dose Inhalers medication. Reduces the need for the patient to coordinate activating the MDI while inhaling medication. Nebulizer Mouthpiece in the shape of a "T" with a 7" tube.